I watched this one after reading a very short but sweet review written by Tasha/Heidenkind – thank you as always! The 18th century England. After the premature death of her husband lady Susan Vernon (Kate Beckinsale)becomes a widow without means. Still, being an intelligent, charming, seductive and manipulative creature, she is eager to find a suitably wealthy match for her sole daughter, Frederica, and a similarly wealthy husband for herself. In order to achieve that much she tours her family and acquaintances – when she is turned from one house she quickly goes to another. She is penniless so what can be done? While visiting her late husband’s brother, Charles Vernon, she uses devious tactics to win the heart of the eligible and handsome Reginald De Courcy (Xavier Samuel), Charles’s brother-in-law. The family of the young man is less than thrilled. Will it end in marriage? Yes. With a movie based on a Jane Austen novel it’s not a spoiler. ;p Still who will marry whom? 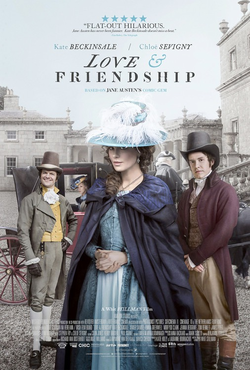 Although adapted from Lady Susan, the film was produced under the borrowed title of Austen’s juvenile story Love and Freindship. It is not easy to take a 19th century epistolary novella and turn it into a movie – a 92-minute movie to boot. Such a literary interpolation is always a risk that you might bore some of your audience to death with constant walking and talking (not to mention letter-reading and talking). I admit the director and Kate Beckinsale did what they could to make the whole idea float but roughly after the first half of the movie I was getting a tiny little bit restless. After another quarter of an hour not even quips of Lady Susan or her unending but very predictable plotting could made me smile. The ending, annoyingly cheerful, was perhaps the weakest point of the whole comedy; mind you I had to skip a scene or two in order to arrive there at all. Overall I wasn’t impressed although I admit the movie had its moments. And its music – the score I found incredibly fitting. A movie for die-hard Austenites who react to the name ‘Jane Austen’ as a cat reacts to catmint. I like Austen’s prose but, despite some sparkles of humour and a pleasant soundtrack, I found this flick too long, too heavy and, overall, boring. This entry was posted in book-film-show, movie review, period comedy and tagged book into movie, Jane Austen, Lady Susan, Love and Friendship, meh. Bookmark the permalink. I think Beckinsale likes challenges. She did the movie ‘Stonehearst’ which is based off of Poe’s short story which is only like 4 pages long. LOL But I feel this fell short compared to ‘Stonehearst’. I am still curious in checking this out. Beckinsale likes challenges and it is perfectly fine. Without her this movie would be hopeless. Still one actress, even the best, can’t help if the director doesn’t have a good idea how to make a watchable film. Ugh. Definitely not for me. Yeah. Not every Jane Austen novel makes a good movie.